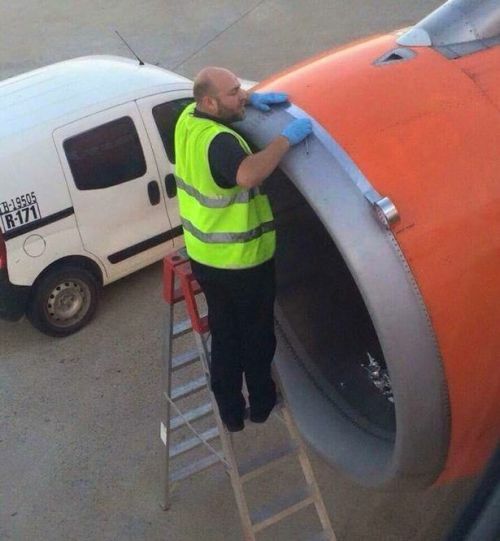 A shocked passenger took this photo of an airport worker sticking tape onto the engine of an easyJet plane just moments before take off and shared it on Twitter. The twitter user @adtom posted it and wrote "Always worrying when easyJet are duct taping the plane together :-s #finaldestination"
But contrary to popular belief, it is not duct tape, the Daily Mail reports. The silver sticky strip is believed to be speed tape, widely used in the aviation industry to carry out quick repairs on flights so as to avoid delays. 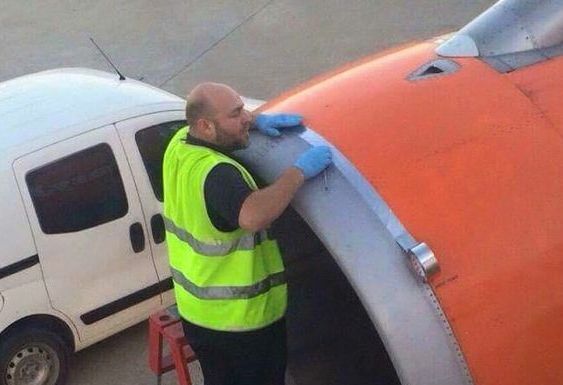 EasyJet was quick to respond to the concerned passenger on Twitter, posting: "Hi Adam, Please be reassured that the duct tape is in place as a result of some cosmetic work that is required to the aircraft paintwork. It is nothing structural and in no way compromises the safety of the aircraft." He took it in good humour, replying: "Phew because we've taken off and I forgot to pack my parachute lol"